Hatefi, 'Abd-Allah (Persian: هاتفی‎‎) was a Persian poet (1454–1521) and nephew of Abdul Rahman Jami. He was born around 1454 at Khargerd, a village on the outskirts of the Khorasanian town Jam (modern Afghanistan). He spent his whole life in his native city and served as the custodian of the Qasim Anvar museum. 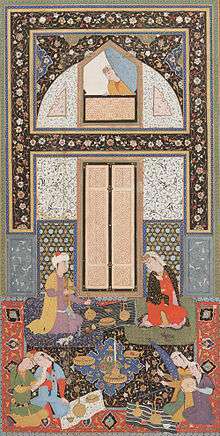 He entered Timurid literary circles after passing a test that was set up by his uncle, the famous Persian poet 'Abdul Rahman Jami. Hatefi was a Shi'ite and was thus honored by Shah Ismai'l the founder of the Safavid dynasty. He interceded on behalf of the Sunni inhabitants of Jām towards whom this Safavid ruler was hostile. Hatefi composed poetry in several genre but he is known above all for his Khamsa (pentalogue). Modelled after previous petanologues of Persian literature including those of Nizami Ganjavi, his Khamsa became famous even outside of Iran. Lami'i Chelebi, produced an Ottoman translation of his work, and the several editions of his Khamsa in the Ottoman Empire and in India are proof of his widespread fame. Hatefi’s literary fame rests on his realistic and straightforward style. He displayed a remarkable originality in hadling his stories and his style was often emulated by later poets. Four of his works in his Khamsa have been published thus far. Wikimedia Commons has media related to Hatifi. 1 2 3 Michele Bernardini, Hatefi, Encycloapedia Iranica.